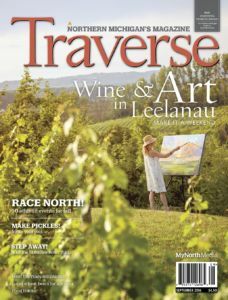 Read Deborah Wyatt Fellows’s Editor’s Note every month with your subscription to Traverse, Northern Michigan’s Magazine. In our September 2016 issue, she reflects on the value in living life intentionally. On Tuesday, September 6, 2016, we will take our last “first day of school” photo. It’s true that the tiny, brave girl we brought home from Russia at 11 months old is starting her senior year of high school. One more year and she will follow her three older brothers off to college and then out into the adventure that is each of their lives. Like so many parents, we have lined the four of them up for 20 years to get that first day of school picture. Looking back at the earliest of these photos, I’m struck by the littlest things—like how did they all have backpacks, permission slips, lunches, etc.—because the further away you get from those days, the more remarkable navigating that every day chaos of four kids seems. 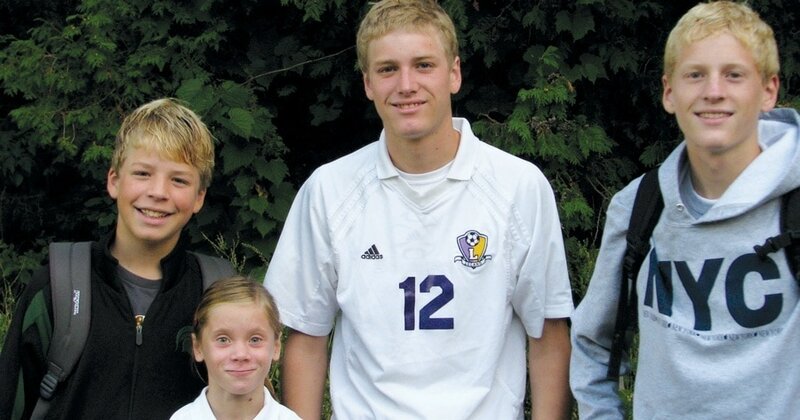 But lately, I’m also aware of how the choices we made as parents about how and where to live have shaped the first two decades of our children’s lives. There are so many choices, and the truth is, the ones we make are the ones they live. Ben was 2 and Peter about to be born when Neal and I made the decision to live on a dirt road, on a lake, with a few wonderful, hearty, year-round retired couples as neighbors, as well as many who come seasonally. Our kids wouldn’t have the neighborhood friends Neal and I had growing up in the suburbs. And while Neal and I each graduated with 700 to 800 in our senior high classes, our kids would graduate with 25 to 35. How do you ever know if those are right or wrong decisions? Clearly, you can’t know. All I can say is that, for better or worse, we made the decision intentionally and then felt both freedom and responsibility to build a family’s life around those intentions. Traverse Editor and my longtime friend Jeff Smith, just wrote a fabulous book, called Becoming Amish, in which he chronicles his childhood friend’s decision, with his wife, to literally become Amish, moving their four children to a community in which they worshipped and built a life. The book is so rich on so many levels and different people will take from it what they want or need. For me, it was Jeff’s message that there is value in living life intentionally. In all the craziness of the world and our busy lives, and in all the joys and challenges that arrive daily, it is possible to intentionally hold onto some tenets of how we want to live and then act upon them. It’s true that at the time we bought the little cottage on the lake, we were more worried about the boys’ ability to make it to the water on chunky toddler legs if we looked away, or how they’d learn to ride a bike if there was not pavement handy. But from the start, I was already imagining the free form fun they would have with a run of the lake, with that dirt road and the streams that cross under it. I was already dreaming of starry nights on the dock, early morning fishing, bonfires and perpetually sticky marshmallow fingers. And lucky us: We have gotten all of that and so much more. It was the life we chose. And so we intentionally biked and hiked, squealed as we leapt from the swim raft, built forts and water slides and very cool zip lines. We drifted the lake at night waiting for the comets to fall from the sky, the nagging thought that there was work the next morning, but being rewarded as kids leapt off the boat in the light of a hundred shooting stars. The truth is, the work of life is there no matter where you live—schedules, homework, dishes, celebrations to plan and losses to endure—making room for shooting stars does call upon intention. I gave a talk recently at Bay View in Petoskey, and afterward a subscriber came up to chat and share her cherished relationship with the region and Traverse. She mentioned having read this column through the years and at one point she said, “I’ve often wondered if everything you have written could be true.” I smiled and told her it was all true, but shared with her that in my family, as the kids grew up, there have been more than a few times someone has commented wryly, “Well, this won’t make it into a column.” Lives are never perfect. No life, lived anywhere, is without challenge. Well, maybe some are, but ours certainly wasn’t. Our kids soared and struggled. They had periods of loving their lives and whole periods where they wished they had someone else’s. But I’ve often said that we don’t raise our kids in Northern Michigan so that they will have perfect lives. We raise them with this place in their lives so that when life isn’t perfect, they have something very real to call upon to help them navigate. Hopefully, they are comfortable with the quiet of the woods so they can step away and clear their heads. Hopefully, they understand the value of conversation and connection that can happen when we slow down, turn off and listen. I do know they have grown up knowing their small community and having their small community know them. Hopefully they have tucked away the value of the intimacy and empathy that comes when your soccer coach owns the grocery store down the street from the school, the same store you head to for after-school snacks, and where you’re certain to see a teacher or a parent in the aisles, one of whom might be facing a family illness—a family to whom we, along with many neighbors, had delivered meals. I know our children have experienced how a shared adventure or a sense of awe can make a disagreement fade, or a chasm close a bit. And I believe they get it that sometimes there are endless sunny days, and then there are days when a cold wind is coming out of the North so strong it stings, but if you turn your face right into it, there is always strength and beauty to be found. It is our last first day of school. We will cherish the year ahead and then spend our time joyfully discovering what a life of intention looks like with these wonderful young adult children, dear friends, community and this place. Always this place, where, for me, intention will always begin. This Editor’s Note was originally published in the September 2016 issue of Traverse, Northern Michigan’s Magazine. 10 Reasons Not to Miss the 2016 Traverse Area Northern Home & Cottage Tour!